Entering the Cappadocia region as if into another world. Valleys, canyons, and hills scattered throughout the region. However, giant rock formations that was the main attraction of this place. These rock formations are the result of rain water and wind erosion over thousands of years. Cappadocia is enchanting tourist attractions in Turkey. Region located in the province of Central Anatolia, Turkey has a uniqueness that is not owned elsewhere. The most famous is the Goreme, a city filled with houses of stone sculpture. These giant rocks dredged manually, and is designed to be a home for local residents. 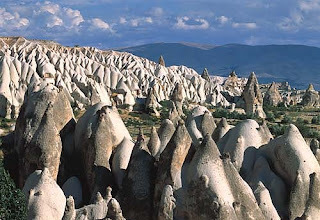 There are 6 cities in the Cappadocia region. The capital is Nevsehir, with a population of more than 110 thousand inhabitants. The unique construction of the stone sculpture you can see in the Palace Urchisar. The palace has some room to be a place to live. It lies right on top of the hill makes this place so beautiful especially with the scenery was stunning, perfect. During a vacation in Cappadocia, you can stay in the city of Urgup. The city has many hotels and restaurants in the cave. Urgup well as a precise point to explore Cappadocia because of the availability of public transport from all over Turkey. If you want to buy presents for relatives in the homeland, you can visit the city of Avanos. The city is famous as the city of pottery and ceramics. You can also learn to make pottery directly at the roadside shops. The most popular activities for tourists in Cappadocia is to explore the 'underground city'. There are many underground tunnels and caves scattered in the region. The most famous areas, among others Kaymakli, Derinkuyu, Gaziemir, Ozkonak, and Mazikoy. Some of the tunnel even has 8 floors arranged vertically. You can admire the architectural masterpieces of ancient Egypt through mansions in Sinasos. 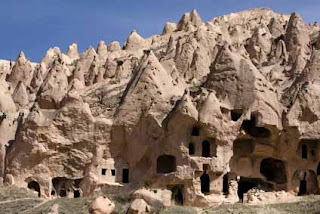 In Goreme, you can also visit the Dark Church in Goreme Open Air Museum. This church has a very beautiful picture on the walls, carved using a variety of colors. Still in Goreme, you can visit Gumusler Monastery built in the 10th century BC. The temple is carved out of stone and has a typical Egyptian carvings. No matter how long you are on vacation in Cappadocia, has not been complete if not hot air balloon. Using a hot air balloon tours, Goreme there. Departing at sunrise, you'll see the sun rays that slowly illuminate Cappadocia. Valleys and hills is also evident from the above. Cuisine is part of traveling, is not it? Therefore, you should try specialties like Cappadocia Testi Kebab. Spiced meats and vegetables cooked in a clay pot, producing a sense of really delicious! In addition, Cappadocia is also a famous wine-producing region.